Hopwood-based artist Paula Hamilton meets a flourishing local art group. As artists we sometimes ask ourselves why we make art when it doesn’t seem to benefit society directly. Art doesn’t feed the poor or cure the sick but it’s often therapeutic. Human beings have been making art for a long time. Even in a tough hunter-gatherer society people spent time and resources making art; they drew and painted events, dreams and stories. They drew what they knew, what they imagined, remembered or wished for. You could say that making art is part of being human. One thing is certain – we love to paint and draw, sing and dance, write and perform and these things enrich our lives. Denise Morris is a local artist who started out by painting the beautiful scenery around Withybed and Alvechurch. She had her first big success back in 1997, when the WI accepted one of her paintings for their annual national calendar. Later on, when Denise had collected a group of admirers who wanted tuition, she started teaching them in her spare room to begin with. When the group grew too large to house in her spare room, she decided to hire Tanyard Community Hall and hold lessons there. Trips to exhibitions, sketching days and demonstrations followed and the group flourished, as did Denise’s own artwork. Now Denise and her art group have started holding their classes in the spacious, light and airy Ark at St Laurence Church in Alvechurch. On the evening that I visited the Hillside Art Group, as it is known, it was only the second time they had met in the Ark. I immediately felt right at home on seeing friendly, familiar faces. Ten local budding artists attend the group – seven on the evening I visited – all of whom were working away to produce artwork for an exhibition to be held in Alvechurch Baptist Hall. Denise herself was originally taught in an Alvechurch village art group and always has a painting “on the go”– often local scenes, the canal being a favourite subject. 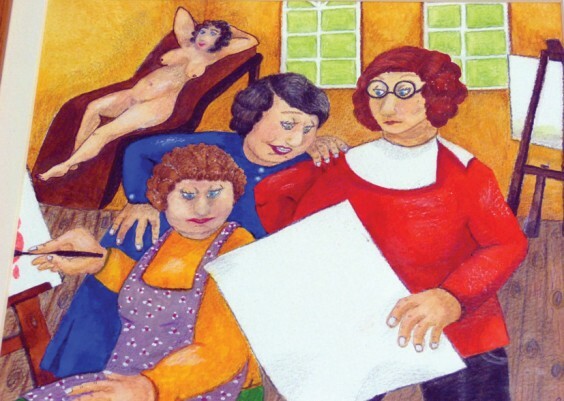 At the start of most classes she demonstrates a technique or subject which her class observes and they later create their own version of what they have been shown. I talked first to Monica Clarke as we know each other from Steff Affleck’s Pilates classes in Rowney Green Peace Hall – small world! She was completing a watercolour of a lake in Wales and, although an extremely modest student, her work looked polished and certainly worthy of being exhibited. Pauline Ellison is a big fan of Beryl Cook’s work and likes to paint in oils. She has made her own accomplished versions of the famous artist’s humorous work (pictured). Bryan Haycocks is also very talented and only rekindled his love of art three years ago. He focuses on landscape painting and was working on a tricky piece involving reflections on water and using masking fluid to retain the highlights. Former architect Gordon Griffith uses his expertise in drawing buildings to great effect. He was busy on a wonderfully detailed drawing of the Doges Palace in Venice, a place Gordon has visited several times. Other Italian beauty spots such as St Mark’s Square have also inspired this artist. The Golden Temple in Amritsar, we both agreed, is one of the most beautiful buildings in the world and is the subject of at least one of Gordon’s paintings. Sue Redding and Margaret Gardner were both busy painting flowers – pansies and chrysanthemums – and were making a lovely job of them. Lastly I talked to Jenny Rankin, a relative newcomer to Denise’s class. Jenny has been keen on art since she was a child but is only now able to find the time to pursue it properly. She is “obsessed” with watercolour and was painting some fine-looking chickens. So it seems that there are clearly many of us love to paint draw, sing, dance, write and perform, and it is almost certainly enriching our lives! If you are interested in joining the Hillside Art Group there is a link on the Ark website: http://www.thearkalvechurch.co.uk and in the What’s On pages of this magazine. * In May, I was wandering through the Kingfisher Centre in Redditch when I noticed an exciting shop full of original art for sale. This “pop-up shop” was negotiated and organised by Arts in Redditch (AIR), a pro-active organisation who are planning a second pop-up gallery this November, in another vacant shop in the Kingfisher Centre. This is great news for artists – a chance to show and sell work in the busiest area of Redditch at a time when shoppers are hunting for unique Christmas presents. In May, 40 paintings were sold and hundreds of shoppers visited the gallery to browse and buy. If you think your work is good enough to be shown, why not visit http://www.artsinredditch.com and express your interest on the form provided – this will ensure you are considered when formal invitations are sent out. Scroll down the home page and see the pop-up gallery box on the right-hand side. There is a blue hyperlink box to take you directly to the form.